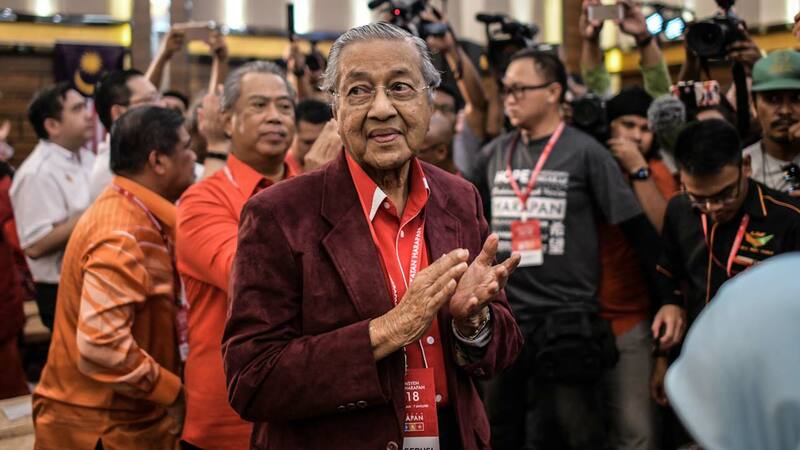 Malaysia’s opposition coalition on Sunday named 92-year old former premier Mahathir Mohamad as its prime ministerial candidate for a general election that must be called by August. With the country’s most popular opposition leader Anwar Ibrahim in jail, Mahathir is seen as the biggest threat for 64 year-old Prime Minister Najib Razak, who is engulfed in a corruption scandal. Mahathir, who earned a reputation during his 22-year tenure as prime minister of being a no-nonsense authoritarian with little time for dissenters promoting liberal values, stands to become the world’s oldest leader if the opposition wins. A victory could also potentially pave the way for former Mahathir foe Anwar to become the prime minister. Mahathir and Anwar’s wife Wan Azizah Wan Ismail will be the Pakatan Harapan coalition’s candidates for the premier and deputy prime ministerial posts respectively, secretary general Saifuddin Abdullah said at the alliance’s convention. If the opposition wins, the component parties have agreed to immediately commence legal processes to obtain a royal pardon for Anwar, Saifuddin said. “…So that Anwar could immediately play a role in the federal government and subsequently be proposed as a candidate for the eighth prime minister,” he said. The Mahathir-Anwar coalition and their endorsement of each other is a turnaround from their bitter feud that has shaped Malaysia’s political landscape for nearly two decades.Anwar was once a protege of Mahathir, and the rising star of Malaysian politics, but they had a falling-out in the late 1990s..